1. Measure baby's foot while wearing a pair of socks similar to the ones your baby'd wear with the shoes you're buying. 2. Flat baby's foot in the paper and use pencil trace the outline of his foot, make sure the pencil is aligned snugly against his foot as you trace. 3.Mark the widest parts of your baby's feet and the longest parts of his feet from the tip of the longest toe to the heel. 4.Then measure the straight-line from bottom line to top in the paper with ruler. *100% soft baby friendly meterial, safety tested for peace of mind. 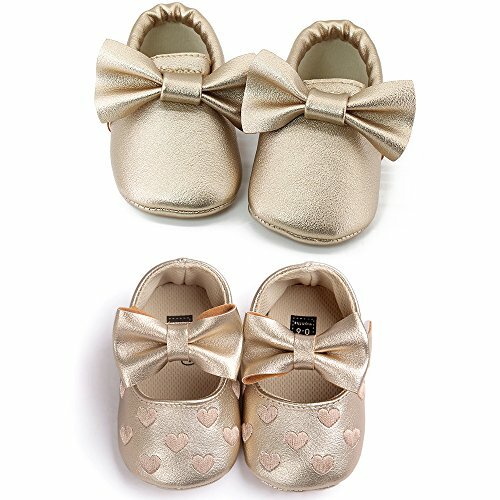 *Lovely and Charming design available,Keep your baby feets soft and warm,Make your baby more lovely. *Soft, lightweight and anti-slip sole is well-crafted to make walking feel natura. If you are satify with our products and service, plesse add to cart. Thanks in advance. Attention: It is about 0.5 or 1cm mistake by manual measurement. If you have any questions about this product by OOSAKU, contact us by completing and submitting the form below. If you are looking for a specif part number, please include it with your message.